Diane Janosek is a woman who will add hours to her work week if it means she can mentor and encourage another person. Her dedication for advancing the field of cybersecurity has been felt by those who have crossed paths with her. 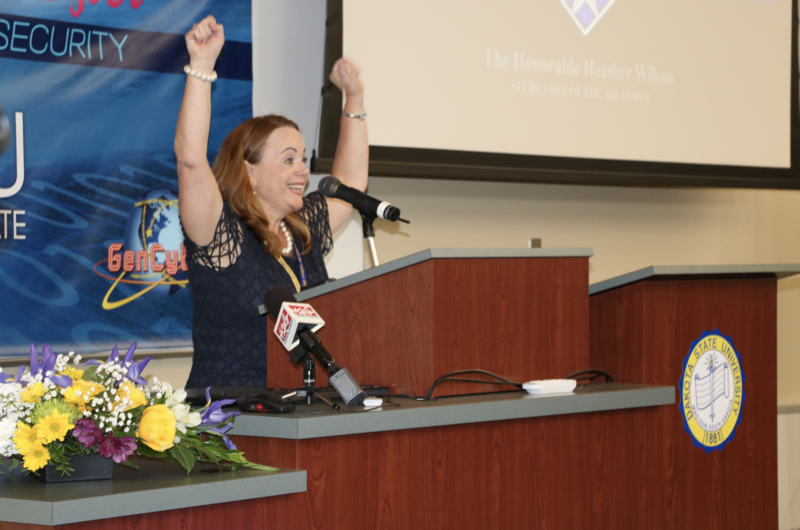 Her energy, excitement, and passion will be long-lived through her commitment to advancing women in cybersecurity. The following is the modified keynote speech presented by Diane M. Janosek, Esq. at the 2018 Women in Cybersecurity Conference, Chicago, IL. Did you know that women represent only 11-14 percent of the cybersecurity workforce – and that there has been no real progress in increasing that percentage over the last two years? Women make up only 11-14 percent of the cybersecurity workforce – hard to believe when you consider how many ladies were represented at the 2018 Women in Cybersecurity (WiCyS) Conference, held in Chicago this past March. I had the privilege of providing a keynote speech during that conference, and I was excited when I learned how many students were there because I am currently working in an academic environment. I didn’t start out focused on cybersecurity. I studied law and am a lawyer, accepted to the bar in Maryland and Washington, DC. However, I’ve spent my entire career in public service and government positions focused on national security. What I’ve learned through my experiences is that cybersecurity is a national security issue. Therefore, I have dedicated myself to educating others on cybersecurity policy and law. I am currently the Deputy Commandant for the National Cryptologic School at the National Security Agency (NSA) where I oversee our five colleges, which include our College of Cyber and our College of Cryptology. I also teach intelligence policy for the National Intelligence University. I enjoy mentoring, and I love when I see the opportunity for national security, the law, and intelligent, capable women to intersect. Women have been influencing cybersecurity since the very earliest computers. Ada Lovelace was a brilliant mathematician who expanded on Charles Babbage’s notes on the Babbage Analytical Engine, providing lengthy explanations as to how the device might work. Additionally, she suggested that it was possible for the engine to repeat a series of instructions (looping) making her widely considered the first computer programmer . Golden Age of Hollywood actress Hedy Lamarr was also a celebrated scientist and inventor. Along with a friend, Ms. Lamarr patented a radio-signaling device that many years later became a crucial part of the technology for securing military communications and cellular phones. Her “spread spectrum” technology forms the technical backbone that makes cellular phones and other wireless operations possible . Have you ever “debugged” a computer? You can thank Rear Admiral Grace Hopper, who coined the term after having to remove a dead moth from the hardware of a computer. More importantly, she is responsible for doing pioneer work in compiling mathematic code into a language that eventually became known as COBOL . Six intelligent women programmed the Electronic Numerical Integrator and Computer (ENIAC), determining how to input its programs and developing an understanding of its inner workings. These women, including Betty Holberton, were responsible for the programming of this computer, which is amongst the earliest electronic general-purpose computers. The ENIAC was designed and primarily used to calculate artillery-firing tables for the United States Army’s Ballistic Research Laboratory and was dedicated in 1946. Ms. Holberton went on to invent the first sorting algorithm and helped to design the first commercial electronic computers, the UNIVAC, and the BINAC . Melba Roy was one of NASA’s female “computers” recently made famous by the Hollywood film “Hidden Figures.” In her position, she oversaw the tracking of the Echo Satellites. Later in her career, she was a talented programmer who focused on APL. These women – their histories, lives, and accomplishments are varied, but I imagine that there are things that they all had in common – connections that enabled them to do what they did, especially at times in history when women were practically unheard of in science and technology. What these ladies had in common are the same things that connected us at the WiCyS Conference. We likewise are cybersecurity pioneers! These women had a creativity that reached beyond expectations. It would take creativity to develop the first coding language and to coin the term “debugging.” Today, creativity is critical. They were passionate – they had to be! Think about Ada Lovelace – she was so passionate about Babbage’s Analytical Engine that, while she was only supposed to be translating his concept, she ended up providing pages of her own thoughts and ideas. Another key factor is camaraderie – or being part of a group that supports you as an individual. Women working in a male-dominated field must strive to believe in a shared purpose, learn to rely on one another, and offer support through successes and failures. It is important that you develop a sisterhood with your peers – classmates, co-workers, and your professional network – which will strengthen you as an individual and will ensure that the nation has a well-supported and capable cybersecurity workforce that functions as a unified whole. Harness your intelligence and strengthen your focus. These factors will underpin your success and keep you competitive and strong in a field where have had to fight for a seat at the table. You have all of these characteristics right now! You are creative, passionate, curious, part of a sisterhood, intelligent and focused – and I challenge you to ignite your spark today! Use this energy to follow your dreams! Do the unexpected! Change the world! Become a cybersecurity professional! Seriously – women in cybersecurity will change the world! In May of 2017, President Trump released Executive Order 13800: Strengthening the Cybersecurity of Federal Networks and Critical Infrastructure, which placed emphasis on building the cybersecurity workforce of the future . Placed emphasis on YOUR importance! Did you know that you were an executive priority in this country? Pretty exciting, right? The order states: “the United States seeks to support the growth and sustainment of a workforce that is skilled in cybersecurity… as the foundation for achieving our objectives in cyberspace” and that the government must evaluate “the scope and sufficiency of efforts to educate and train the American cybersecurity workforce of the future, including cybersecurity education curricula, training, and apprenticeship programs, from primary through higher education.” This means that cybersecurity education is not only critical at the collegiate level but throughout the entire education system in this country. In 2017, I met a group of bright young women in Colorado. 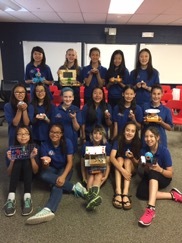 They were participating in a GenCyber camp focused on cybersecurity principles with instruction in Mandarin Chinese for 80% of the time! Though early in their educational journey, they are part of our nation’s effort to strengthen our cybersecurity workforce of the future. Our desire is that these ladies will one day help to bring that 11-14 percent closer to a more equitable statistic! GenCyber is a joint effort between my agency, NSA, and the Department of Homeland Security to bring cybersecurity education to the next generation of cybersecurity professionals . This program started in 2014 with only eight camps, reaching 240 students and 30 teachers in six states. As time went on, there was so much interest across the nation that this year we held 130 camps and reached 3,350 students and 837 teachers in 39 states. GenCyber recognizes that we must engage with kids at a younger age, especially girls, to teach them about fields like cybersecurity. Cybersecurity skills are crucial to the national security of our nation; hopefully, these young ladies were energized by their participation in this GenCyber camp and will mature to become the cyber warriors of the future. Let’s now consider energy. Energy cannot be created or destroyed – it can be stored, channeled and transferred. Your brain is like a computer – electrically charged and storing, channeling, and transferring energy. Your brain gives you the ability to speak, imagine, and problem solve by using its approximately 100 billion nerve cells called neurons. Neurons gather and transmit electrochemical signals – very similar to the gates and wires in a computer. While neurons might seem like other cells, they are special due to the electrochemical aspect that lets them transmit signals over long distances and send messages to each other. So, if you think about it – the neurons in your brain are making connections in the same way a computer makes connections internally and when it reaches out over the network. In June of 2015, the New York Times published an opinion article called Face It, Your Brain is a Computer . In this article, the author Gary Marcus (a professor of psychology and neural science at New York University) likens the brain to a “serial algorithm-crunching machine.” Even your emotions are the result of transmitted signals, integrated information, and the transformation of input into output. Marcus reasoned that “if neurons are akin to computer hardware, and behaviors are akin to the actions that a computer performs, computation is likely to be the glue that binds the two.” A second article, this one published in Business Insider in 2016, highlighted the view of Scott Aaronson, a respected theoretical computer scientist at MIT . “His view… is that because the brain exists inside the universe, and because computers can simulate the entire universe given enough power, your entire brain can be simulated in a computer. And because it can be simulated in a computer, its structure, and functions, including your consciousness, must be entirely logical and computational.” Just like a computer. The connections made by computers across the globe are no different from the connections we make every day. Connections that enabled Hedy Lamarr, Rear Admiral Hopper, Melba Roy, and many other women to change the face of computer science and, thus, the world. So, now, it’s up to you to dive into the future to see who you will become and what great things you can and will do to change the face of cybersecurity. I encourage you to channel your energy – connect with your network – and change the world through cybersecurity. Remember to always be authentic – be true to yourself. You are empowered! You belong here! Cybersecurity needs you. America needs you!